Background: Kenya hosts numerous refugee women. As these women struggle to find normalcy and build a life in Kenya, they have unique needs. Amani Ya Juu is a social enterprise that helps women find peace and also build livelihood skills through sewing and selling products. Amani also serves an equal population of vulnerable women from the host (Kenyan) population. 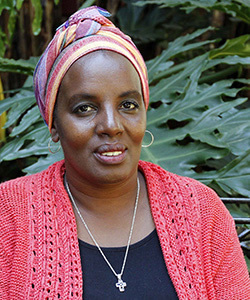 Crystal Corman met with Joyce Muraya at Amani’s café in Nairobi on November 15, 2014 to learn about the program, their faith-based motivation, and also the women who come seeking peace. Joyce described the complexity of working with women from different contexts and faith backgrounds, as well as the intense work needed to cope with trauma. Please tell me about the origin of Amani Ya Juu. The organization was began 18 years ago by an American missionary woman who had post-war experience in Liberia. She and her family had to leave the country of Liberia where they had been serving in a Christian college, and they came to Kenya. She developed a passion for working with refugee women because of her own experience of fleeing from Liberia. She started the program with three women; they made placemats. I remember her telling me that they agreed that they would make the best placemats possible! She would then sell them to friends and contacts. They began meeting to work in a garage here on this property that was at the time host to an organization run by a British missionary couple. That’s how the organization grew. Eighteen years later, how does the organization look today? How many women are involved now? We have about 80 women right now, who are regulars at Amani. Regular means we see them three or four times a week, because they don’t come every day but are free to take work and work from home. However, they are engaged in Amani life events such as prayer days and retreats. Then we have some who have continued to remain connected with us but have moved on to work elsewhere. Can you describe the group of women currently active? About 50 percent of the women are refugees, and the other 50 percent are Kenyan. We have some from South Sudan and others from the Great Lakes region—that is Rwanda, Burundi, and the DRC. We’ve also had a woman, one of the founding women, who was actually from Mozambique which is pretty far away. She came from Mozambique during their war and came and lived here. We have people who are dislocated by life circumstances, such as those from Tanzania. We also have Kenyan women. Kenya has multiple ethnicities, so we have women from different ethnic communities around Kenya. Again this would be people dislocated by life circumstances from their homes. Some would be what you would call materially poor; people who don’t have the means to support themselves and care for themselves. Do the Kenyan women end up in Nairobi because it’s an urban center and they are seeking better opportunities? Yes, that’s right. If a woman is single and she has been separated—either from her family or her husband or is widowed—then there may be situations where she is not welcome in her husband’s home, which is traditionally where she would find room or maybe some land to support herself. So some of these women gravitate to the city. And then there are younger women who come just to seek employment because it is an urban center; it is the capital city. What does Amani Ya Juu offer to these women? We offer them skills training, and the primary skill is stitching. Because we are a social enterprise there is a lot associated with running a business. There is the skills in stitching, but there is also a little bit of beading, fabric treatment, tie dye, shop and café sales and management, and all those other things that are associated with an organization like Amani. We train them in packaging, customer service, merchandizing, and basic bookkeeping. We also have a strong emphasis on developing leaders. We train some women to lead groups, teams, departments, or programs. How does religion or faith fit into the organization and its work? We are a faith-based organization—unapologetically faith-based. You’ve noticed our product tags have scriptures on them. That’s because we believe peace comes when you have a relationship with God and you are able to make peace with God. And then out of that peace, you can have peace in your heart. When you have peace with God you can make peace with others, and you’re able to find peace in your context. This is also where the component of “just pay” comes in; recognizing that justice is a very significant component of peace. We seek to find ways to help people come out of systems of injustice and exploitation. How does this faith foundation play out in your programming with the women? We recognize that a lot of people have had their lives disrupted by conflict. This can be physical conflict, such as war and all the associated losses of loved ones and or possessions, home and country and even the loss of identity. And that becomes a starting point where we encourage them to seek making peace with God. When you see your family killed, you could start having real questions about life. So finding peace with God is a starting point, then seeking to forgive the offending other and what the other represents. We sometimes have people from two opposing sides of a conflict; at Amani they become a representation of that other. So we talk about those things. We talk about how God’s forgiveness demands that we also forgive one another, and it becomes part of the way we heal. I find it very hard to capture that part of our work in a few words, without looking like I’m glossing over it. Or without looking like I have some words that just roll of my tongue easily. It’s difficult. It’s a very difficult process. That’s why our program takes four years. Recovery and coming out of trauma takes a long time. We offer opportunities to engage in counseling with a group. This allows newer women to be with people who have walked ahead of you in this journey. How do women find this organization? They are referred to us by other women in the organization. One woman may come and say, “I have a friend or neighbor who is struggling, is there room for her?” We interview and then when we have the opportunity or opening, we invite her in. Our friends and friends of the organization also bring us people that they think would be a good fit and can benefit from joining Amani. Do you have a maximum capacity that you can handle? I think we do. I think we’re close to capacity. If all the women are in everyday, then that would be a challenge right now. But because they don’t come every day, it becomes easier. I think our capacity is more determined by the amount of work we can generate for the women through our sales. That’s a big mandate as the leadership has to aggressively pursue markets for our products. What types of markets have you been using successfully and which aren’t working so well? We have our shop here in Nairobi and export market in the United States that has been the mainstay for many years. We also have local partners with places like hotels and craft shops, specifically some of the upmarket craft shops. Our products don’t quite fit into the Masai (Craft) Market model here in Kenya, so we look for upmarket craft shops to partner with. What hasn’t worked are the hotel gift shops. We have one currently and had another for a number of years that was out in Naivasha, a conference destination. The sales there have dwindled significantly. We continue to explore what works. I think that has evolved over the years. You start with what you know, and I think that the initial audience was the missionary community here in Kenya and Christians in America. Now our design team is a very cosmopolitan group. In the last couple of years we’ve three American women, two Kenyan, and one Italian volunteer meeting under our creative director; this represents different demographics also reflecting the changing faces that come through our shop. Can you explain how the program is designed and how a woman would progress through it? When they first come in, it’s just often trying to integrate the women into the organization. Early in the program we meet with them to discuss discipleship and introduce the basics of the Christian faith. We have women from so many traditions and from other faiths so we’ve determined the best way to integrate them is to offer a basic discipleship curriculum We talk about foundational things—the Bible, what it is, who wrote it, creation, what other creation stories come out of our traditions, what is the biblical creation story, what are the differences, these kind of things. It’s very basic stuff. It can be dry theologically so we intersperse it with a Bible study of women that Jesus interacted with during His ministry. For example we have studied the book Jesus Cares for Women by Helene Ashker that has been a good tool for helping women to heal. I’ve used it so much, it’s very worn. As we’ve done this study that speaks to the pain of trauma, of betrayal, pain of loss, the women are able to identify with the different stories and maybe for the first time speak about their own loss and pain. In the meantime, the women train on products that have an increasing construction complexity starting with a simple coffee bag to an elaborate tote, quilt, or even dress. From the welcome and discipleship lessons everybody develops at their own pace. There are who come from such a traumatic past, that they need a lot of space and a lot of time to integrate into the organization; to learn to trust and to feel accepted since they have dealt with a lot of rejection before they can apply themselves to the skills training. You are a Christian organization, but how do you work with non-Christians? We are unapologetically Christian, but we also recognize that the Christian faith is a journey. We recognize that at Amani we have something that is so great and we want to introduce other people to it—God’s peace. As an example, some of the customer relations training we give to the women is that “not every customer who comes to our shop appreciates Christianity. It can be off-putting for some people.” But, we do have a peace in God that draws them to us, and therefore we can respond to them with peace. In the café, for example, we don’t say we have difficult customers. We say that we have customers who don’t have peace. It gives a paradigm that’s true and useful in view of the power differential that often emerges between those with material wealth and those without, those with more education and those with little basic education. So though a shopper may appear to have a lot of money when the Amani shop staff or café waitress doesn’t have the same kind of background, our paradigm allows the women to see that they have something these customer does not have, the peace of God in their hearts, and that that peace is a treasure they can share with others. How does one graduate out of the program and prepare to move on? There are several exit points. Relocation or resettlement for refugees is one point, where they go to a third country. That comes at any point in the women’s journey. It can come really early, after a year or so, but it can also come after she’s been here for a very long time. Another exit point is when peace is established in a home country. Then we notice that the women are traveling back and forth more and more until a final exit. We had a couple of Sudanese women who actually went back to South Sudan, after its independence. The founder of the Burundi center is actually a returnee. The founder of the Uganda center is also a returnee. We have had some women exit to other organizations to train others women or even men. For example some organizations doing leadership training come to us to ask if we have women leaders that we can lend to them. We will send them a leader and that becomes an exit point. We have a couple of our women who are now working as community representatives with HIAS (an international organization that works with refugees). We have other grassroots organizations that ask us to send them a team of women to facilitate different types of training. It could be for a brief period of time that they go and mentor. Right now we have an organization in Tanzania that is asking us to send two women to train children, so they’ll go for a month and come back just before Christmas and come back. As such partnerships develop, the position for the Amani trainer may sometimes become a permanent engagement. We don’t ask people to leave, but sometimes women respond to the ups and downs in the market (as sales fluctuate here) and as they realize they cannot depend entirely on Amani they may take on side businesses like hairdressing to have multiple revenue streams coming in. As they grow in different skill the women may decide to exit and utilize some of their other skills. We find people to be very creative. Do some of the women go on to become entrepreneurs with their own business? Yes, some of them will become entrepreneurs. We help them to buy sewing machines so they have a level of autonomy from Amani. Some of them will retain their contact with Amani, coming here three days in a month, but they’re running a similar business elsewhere. They’re not making the same products as us, but may be sewing and selling clothing, for example. What other organizations do you see working with refugee women in Kenya? Do you partner with any of them? There are lots of other grassroots organizations doing this kind of thing with varying degrees of success. Because Amani has been doing it for 18 years, we are a little further along. Some organizations began with stitching but then diversified, like Beacon of Hope that now runs a school and a hospital. They were working with women who were HIV positive and so they started a medical component; they began running a clinic for women that has since grown. We also belong to a network of organizations that meet under the UNHCR; these are organizations that are doing education training in livelihood for refugees. There are a number of organizations under that umbrella. It gives us an opportunity to see how we can synergize but also to not all do the same thing. But the need is so great. Since you work with women, what are some of the needs that women have in particular? To start, it’s easier to gather women. Men don’t gather as easily. Women are wired to create social networks that allow us to gather. There is the challenge of dealing with women from different backgrounds, especially when their culture has destructive conditions for women and girls. Often women still cling to these norms even if they are detrimental to them and their daughters. In cases of extreme poverty, women are often left to fend for themselves and their children and therefore come with multiple needs and challenges such as affordable healthcare, school fees, shelter, childcare for children below school going age. All these may hamper a woman in the very critical responsibility of giving care to several children. In addition to their own children, many women are also often taking care of relatives. We also find that we have to accommodate particular needs, because women don’t have space to compartmentalize their lives and we want to support them so they meet all their needs. We have opportunities for women to come with their children. We also allow them the opportunity to work from home. We make space and recognize that women need to be available for their children. I think that one of the advantages of working with women is that women really know how to celebrate! There is no holding back when there is a reason to celebrate. It’s always a joy. Do you work with the women on education about their health needs? There is a partner organization that over the years has funded a monthly clinic. Part of the funding also goes towards getting a public health worker usually a female nurse who comes and talks about different health concerns such as reproductive health, nutrition, and care for the terminally ill because women are the ones who become the primary caregivers for sick family members. What ages or life phases do you have at Amani? How do these generations mesh together? I say we have every expression of womanhood: young women, not married, no children but have need for a job. We have single moms. Then we have widows at every age; we have grandmothers, married women, we have even had women who find themselves in polygamous marriages when the husband “marries” another wife. The women do come together and support each other. I think that’s a strength for women. They recognize what they have and can teach others, work with one another. You can see some of the older women very deliberately seeking out some of the younger women to mentor and to train. If somebody is widowed then you’ll find some of the older women who have been widowed longer walking very closely with that person. You don’t even have to ask, it seems to happen naturally. How do these women’s husbands fit into their life and experience at Amani? Do the men also want such programming and opportunities? Most men support their wives’ work at Amani. But in situations when a husband has no work and the wife is working, that continues to be a challenge. Some of the women come from a place with certain stereotypes and cultural worldviews. When the man is not working but the wife is, sometimes things become turbulence in that marriage. It is a challenge to navigate marriage in a context where the traditional roles of men is as providers and women are homemakers and that becomes unworkable. It’s an area that has come to my attention so consistently of late I’m wondering how to help the women to navigate because they do need to. So those are some of our concerns, very legitimate concerns. Are there other organizations that the men can turn to so they feel more empowered? Yes there are programs, especially among the refugee community. There are other organizations that will give micro-loans to men (and to women) who think that they have a trade that they want to pursue or a business that they want to run. Once in a while when Amani has construction work, a few men are invited to form work parties and they engage in minor repairs or extension work. It is only when there is a task to be done, that’s when we are able to gather men. A while back the men helped us do the floor of the Tie and Dye studio. This work is very limited but we hope that they will find other opportunities outside of Amani. How does Amani operate financially? Is it from grants or donations? The business we do at the shop and cafe supports the running of the organization. We are not donor driven, but we do have opportunities for people to partner with us with major capital expenses. Currently we plan to do a facelift for the entrance way and some individuals have given towards this project. Our programs such as Amani Watoto and Amani Sasa, which work with the Amani women’s young children and teens respectively, are run through the giving of friends of Amani. A lot of the gifts have come out of the U.S. because formal local fundraising is only beginning in Kenya and there has been no culture sustainable month-by-month giving. However Amani hopes to see this Kenyan community also embrace the work that Amani does by also supporting this critical programs. What is your story and how did you find Amani? I was serving in a local church and a friend of mine told me that Amani was looking for a women pastor to come and coordinate the ministry of this organization and that’s how I came in. I served as ministry coordinator for two years, part-time from 2006 to December 2008. And then when the founder left to go back to Liberia, and the new director was relocated with her family, I stepped in. That was January 2009. When I first became country director, the first thing I felt was a sense of inadequacy to lead an organization like this. I’ve grown in my understanding of conflict and the effect is has on people. And because of that, I enrolled in a doctrine program on leadership and conflict transformation at AIU here in Nairobi. This is my fourth year. I’m just getting ready to defend my proposal and then do my research and finish writing. You said you were a pastor. What’s it like to be a female pastor in Kenya? I grew up Presbyterian, and I had an aunt who was a church minister at the Presbyterian Church, so I never found it strange that a woman could be a pastor. I think women in ministry are a powerful voice, because it represents a perspective that men don’t always have. Women have served on a pastoral board; I know there are things that I would speak to and bring into that board, which male members of the board cannot see. It's very critical that we have women representing there. Sometimes I hear that women are represented through their husbands, but I know that in reality when it comes to making decisions within a pastoral board, the feminine/women’s perspective may not necessarily be heard or represented unless there are women present. Do you think women are more spiritual than men? Or is that a part of any ethnic group here in Kenya? I think that in Kenya there was probably equal representation of spiritual leadership between men and women in the past. And that could probably provide the space for women to be accepted as spiritual leaders in the church. When I think about the history of some of the ethnic communities, I think women who had that spiritual gift, or calling, commanded the same amount of respect as the men.